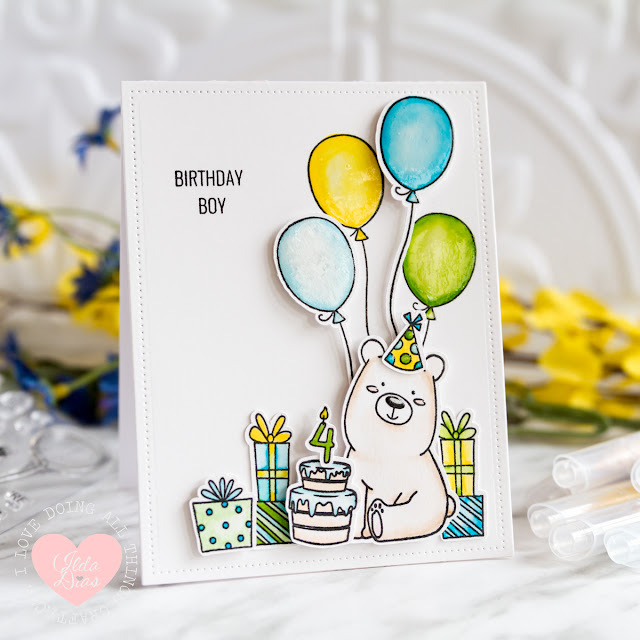 I'm back today with another card featuring Kobi the Birthday Bear Stamp Set from Studio Katia. This time this card is for my little Godson who turned 4 last week. Can't get enough of this cute little bear... that smile is so sweet and this stamp set has been so useful for my August bdays! This card was pretty quick and simple to make and put together, especially since I had recently made another very similar card for my niece. I colored these images all in with Zig Clean Color Brushes and then cut them out using my SnC2. To cut out the front panel I used the Darling Ribbon and Dotted Frame Dies. To finish the card I added some glossy accents to the balloons and to a few other areas. Super easy! Hope this Kobi the Birthday Bear card has inspired you today.